The value of bitcoins has dropped after the closure of the clandestine Silk Road online marketplace. The FBI seized bitcoins worth approximately $3.6m (£2.2m) on Tuesday. The price of a bitcoin, a virtual currency for use online, fell steeply after the arrest of suspected website administrator Ross Ulbricht. Investor confidence may have been shaken by the association of bitcoins with illegal activity, according to a security expert. "When there's a big bust, that's going to knock people's confidence in investing," said Rik Ferguson, a senior researcher at security company Trend Micro. "The more a currency is associated with illegal activity, the more people will be nervous about using it," he said. 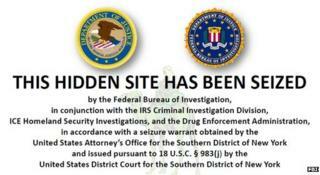 Silk Road, which allowed users to trade in illegal drugs, required transactions to be made using the virtual currency. But it may be better to think of its units as being virtual tokens that have value because enough people believe they do and there is a finite number of them. Each bitcoin is represented by a unique online registration number. These numbers are created through a process called "mining", which involves a computer solving a difficult mathematical problem with a 64-digit solution. Each time a problem is solved the computer's owner is rewarded with bitcoins. To receive a bitcoin, a user must also have a Bitcoin address - a randomly generated string of 27 to 34 letters and numbers - which acts as a kind of virtual postbox to and from which the bitcoins are sent. These addresses are in turn stored in Bitcoin wallets, which are used to manage savings. They operate like privately run bank accounts - with the proviso that if the data is lost, so are the bitcoins contained. News of the closure was followed by a rapid drop in the price of bitcoins, according to figures from the Mt. Gox bitcoin exchange. The going rate for the virtual currency dropped from more than $140 (£86) to around $110, before climbing back up to $123 (£75). Investors may have been concerned about the FBI's ability to confiscate bitcoins, said Mr Ferguson. "Knowing that a currency could be seized or shut down could pressure people to look for alternative investment vehicles," he said. The FBI seized the virtual currency by getting hold of encryption keys for the bitcoins, according to Jerry Brito, George Mason University's technology policy director. The keys were made available through seized computer equipment, Mr Brito said in a blog post. The FBI then transferred the bitcoins to an address controlled by the US government, according to the seizure order (PDF).